The Liddy Shriver Early Career Research Award is intended to recognize, with an elite international award and lecture, an outstanding early-career researcher working in the sarcoma field. It is not primarily an award for future research, but an award based on track record of early achievement, and is intended to be international in scope. An important aspect of this award is the lecture at CTOS and subsequent publishing of the lecture. he CTOS 2019 Annual Meeting will be held November 13-16 at the Hilton Tokyo Hotel in Tokyo, Japan. CTOS is comprised of physicians and scientists in various specialties engaged in the treatment and research related to connective tissue oncology. 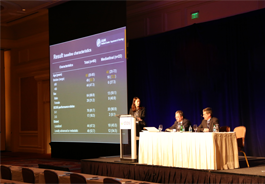 Physicians, residents, colleagues, and healthcare professionals who specialize in sarcomas come together during this meeting to discuss new developments, treatments, and advancements in the field. Become a member of the society with one of the largest groups of healthcare professionals working with sarcomas. CTOS is a one of the few organizations where scientists, clinicians, and other people interested in sarcomas can gather to hear about the latest work in a number of specialties, be it pediatric oncology, translational research, radiology, surgery, radiation oncology, medical oncology, and more. The program offers a primer or refresher on this rare group of diseases, and provides opportunities for fellows and faculty alike to discuss the latest research and to stimulate new projects for the subsequent year. I am a strong believer in interdisciplinary research, and CTOS provides a forum for this work that is unique in oncology. 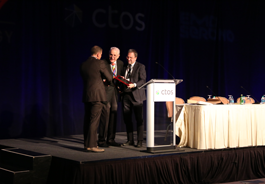 CTOS has been growing to become the forum where leading professionals devoted to the diagnosis, treatment and research in the field of mesenchymal tumors meet; share experience, information and ideas; and plan studies. Its friendly environment has contributed significantly to advance the management of these challenging neoplasms as CTOS has facilitated the sharing of experiences and knowledge from around the globe, and has advanced our understanding of the biological background for looking for new therapies. I have always felt the Society as a family of people I am part of and consider the annual meeting the most important academic meeting of the year. The Connective Tissue Oncology Society is a non-profit professional medical organization whose members are a multidisciplinary group of specialized physicians, medical professionals, and scientists from around the world to connect, collaborate, and share their knowledge, experiences, and research for the advancement of treatment of sarcomas.